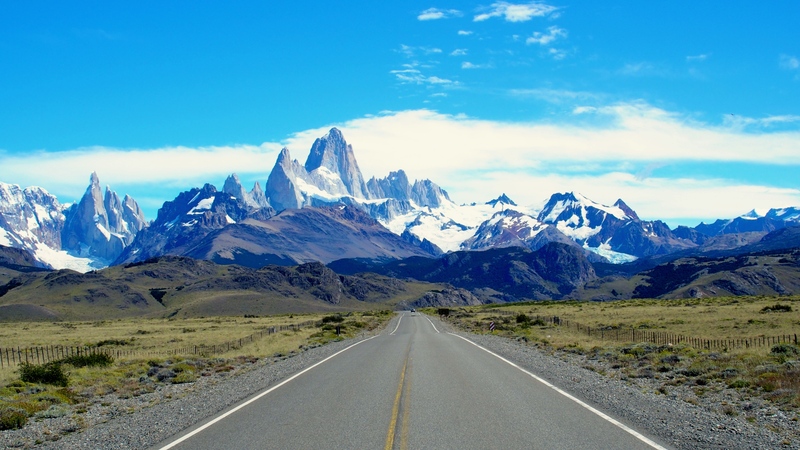 Deserted highway on the way to Fitz Roy (the tallest mountain in El Chalten). 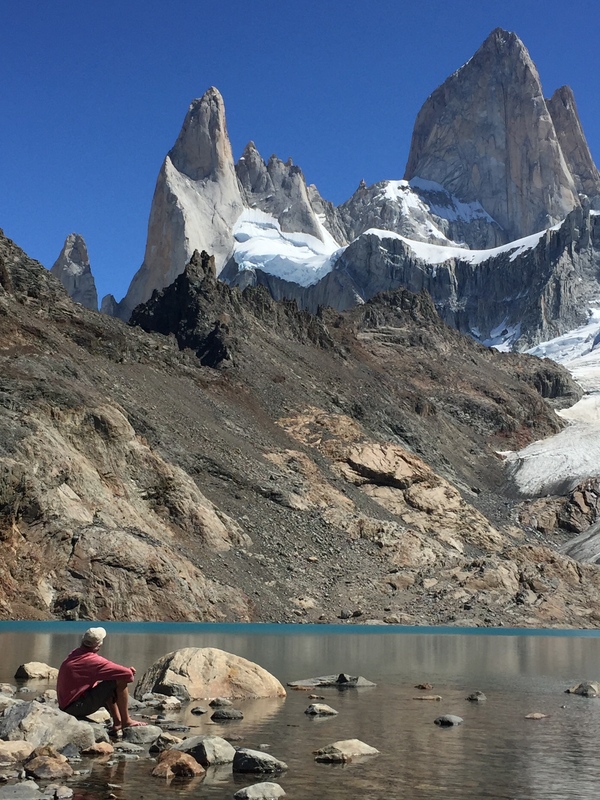 Patagonia is a backbacker’s mecca. We saw numerous pairs and triplets of hitchhikers trying to get rides to cross many miles of the desolate terrain. 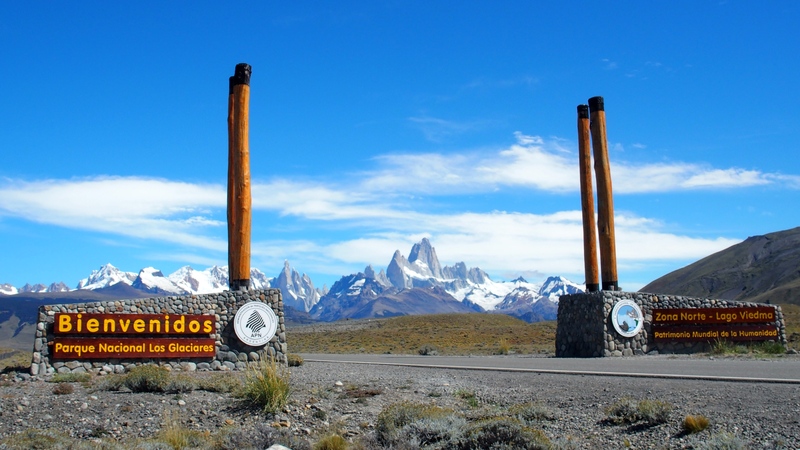 Northern entrance to Parque Nacional Los Glaciares, still many miles to the glaciers. The hitchhikers carried heavy packs with camping gear. We didn’t go that route, but did some glamping (glamorous camping), staying in an ecodome. The accommodations offered simple geodesic domes, each with a bed and a small bathroom, with a shower and hot water. The days were so hot we didn’t think we’d need a fire, but after the sun set, we were happy to have our little wood-burning stove. 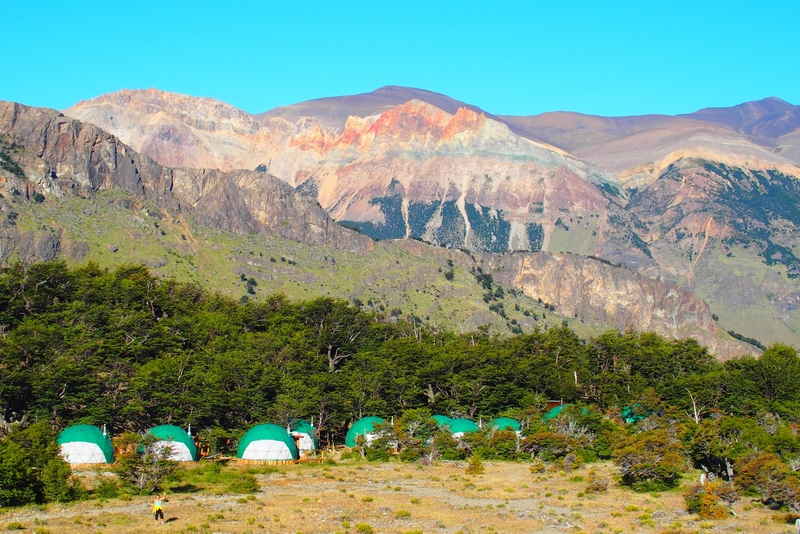 Our ecodome village in the Andes. The big advantage of staying in the ecodome was the access to hiking trails into the mountains…along with a very comfortable bed, hot shower, protection from the elements, heat, and a fantastic parilla (grilled) dinner. The view from our bed. 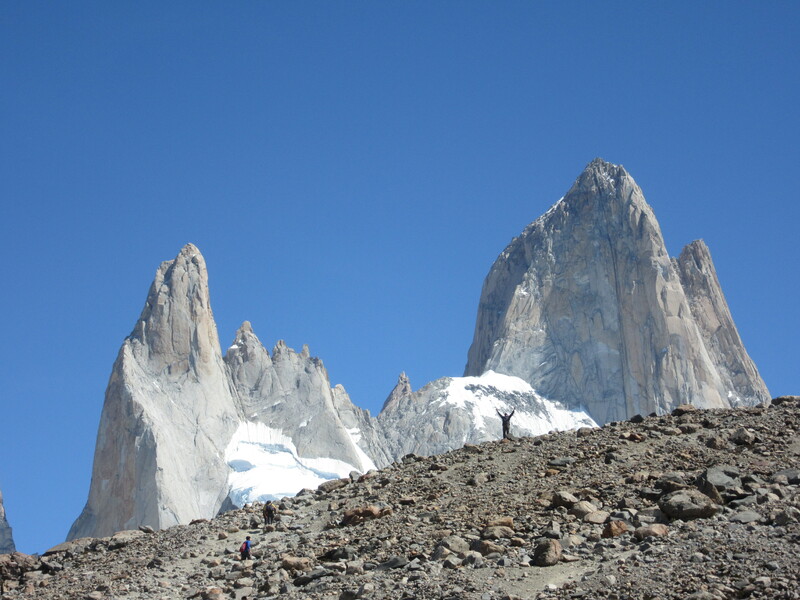 Mount Fitz Roy on the left and Cerro Electrico on the right. Notice that Cerro Electrico is red while the other mountains look black in the right light. That gave rise to the name Cerro Electrico and the river between the two mountains, Rio Electrico, with red anode and black cathode peaks overlooking the fast-flowing water. A strong current, get it? 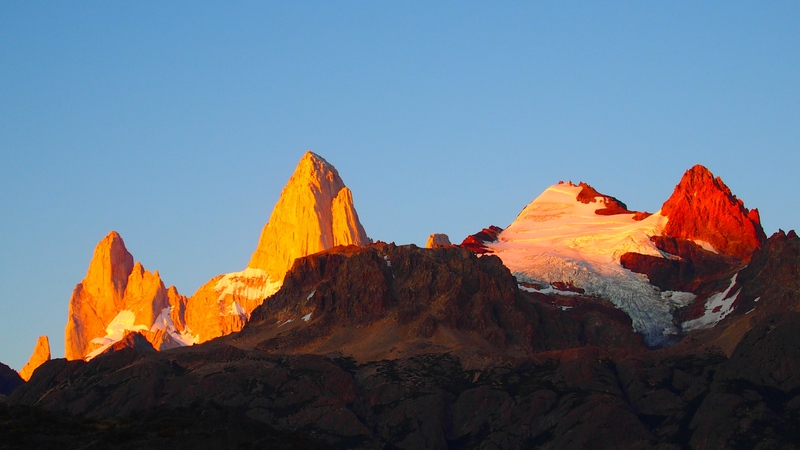 The Cerro Fitz Roy and Electrico view, even more impressive at sunrise with changing colors. Why do men climb mountains? Because they’re there. 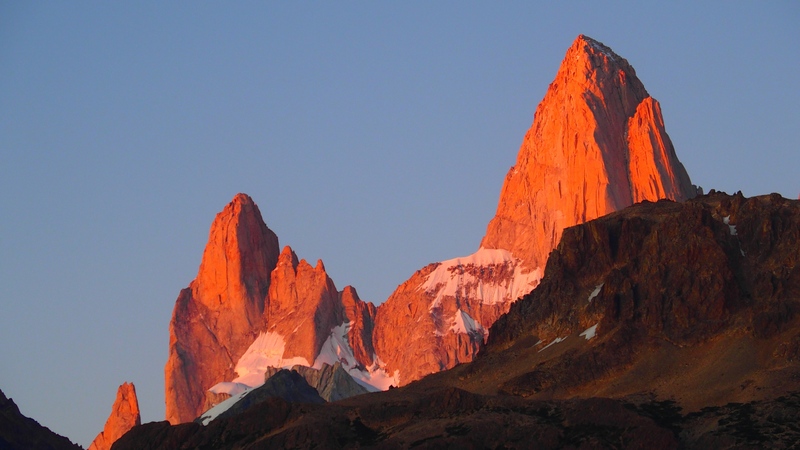 The mountain, Cerro Fitz Roy, was named by Francisco Moreno (the scientist and scholar that Perito Moreno glacier was named after). 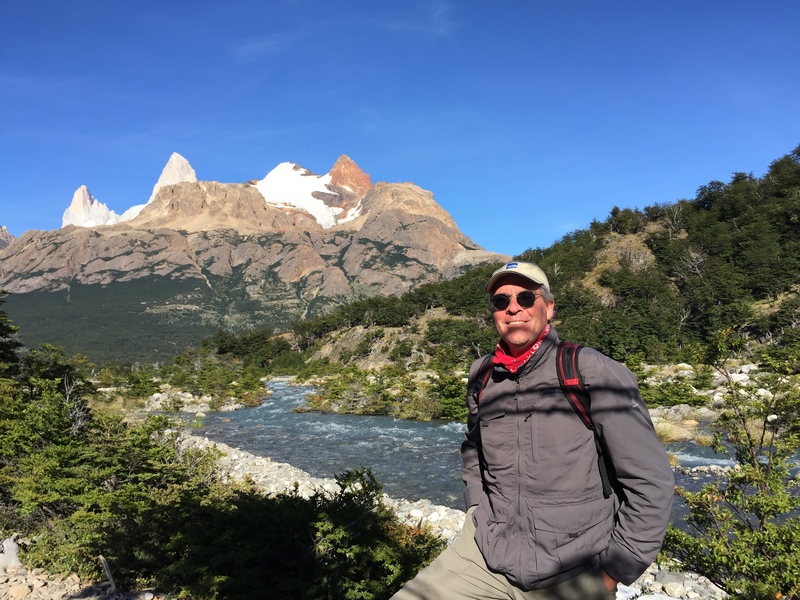 He selected the name Fitz Roy after Robert Fitzroy, the captain of the HMS Beagle that sailed up and down Patagonia’s coast and hosted Charles Darwin on his famous visit to the Galapagos Archipelago and many other South American regions. 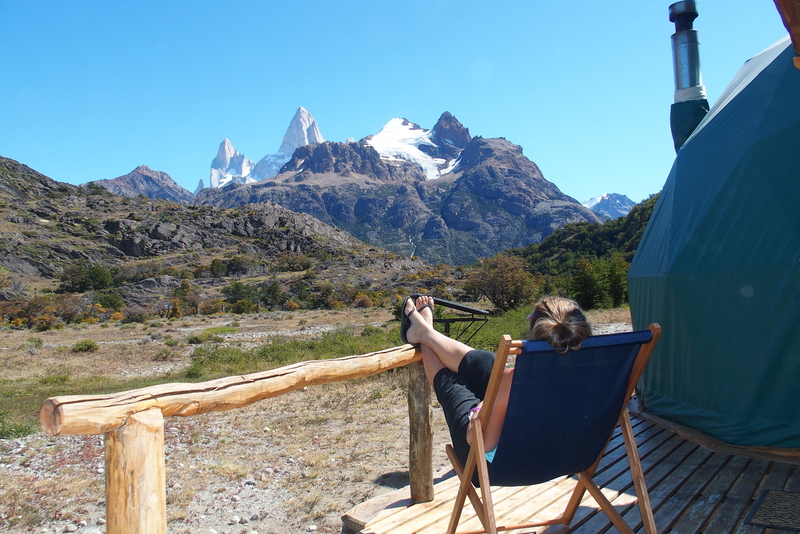 The deck of our ecodome, a nice spot to watch the peaceful sky over the Andes peaks. 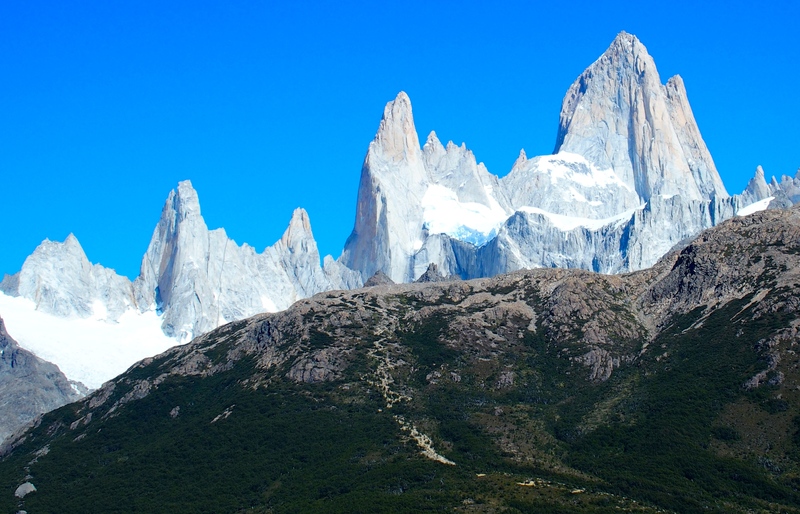 The familiar Patagonia logo is Cerro Fitz Roy! Who knew? 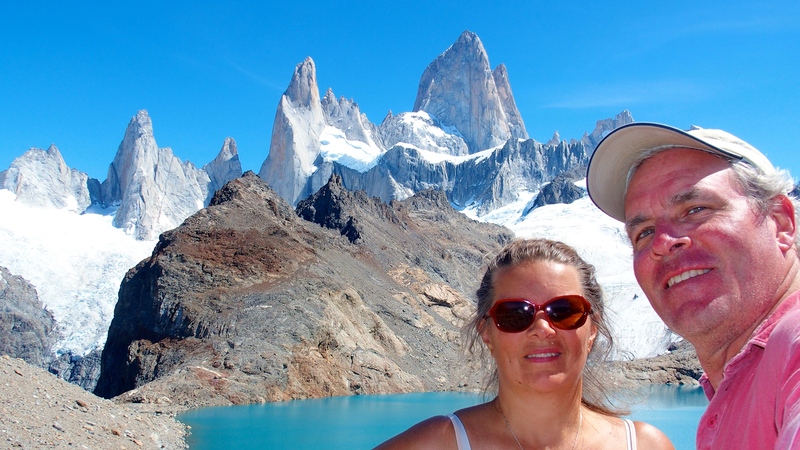 We decided to hike as close as we could get–comfortably–to Fitz Roy. No need for the heavy-duty climbing gear from the outdoor clothing companies, just a few layers and some water. The hiking route was identified as a 6-hour round trip. Ha! Quite a bit longer for us. A mile into the hike, the air was still chilly and the peaks were far away. 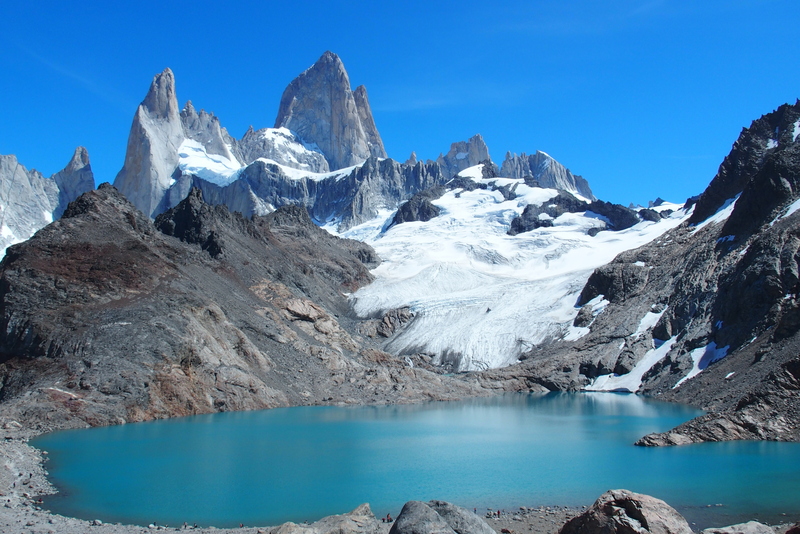 Warmer now, with Fitz Roy still far distant in the background. The rise behind us was a serpentine path very much like Quarter Dome on the way up Half Dome in Yosemite National Park. Of course, we hiked that over 20 years ago! The last bit of climbing was above the treeline, with nothing but rock and thin air. Michael charged ahead. Nancy took her time. 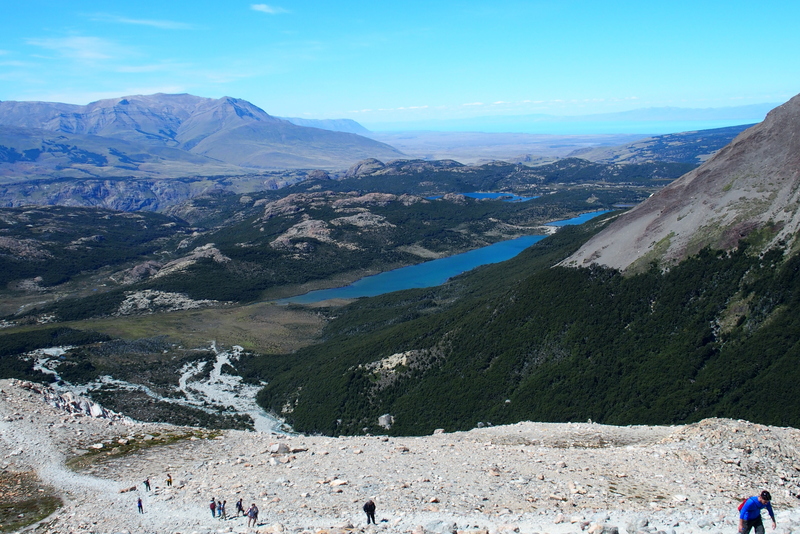 At the summit of our climb we were about 2,500 feet above our origin, looking down at the lake, Lago Viedma, at the level of the town of El Chalten. Look how far we’ve climbed! Nancy is one of the tiny ants at the bottom of the photo, with the yellow jacket wrapped around her waist. Michael, cheering from the top. Note that he hasn’t climbed down to accompany Nancy on the home stretch! At the top, the view was worth the arduous hike. Although Mount Fitz Roy still looks far away, we were fairly close to a glacier slowly melting to create this blue-green lake high in the mountains. Climbers hike to this level and camp close by to start the actual technical climb early in the day. We dipped our toes in the water. Not that cold! A very refreshing break after the climb up the mountain. At that point, we could have gone on..if we had Patagonia or North Face climbing gear and a lot more energy…but we simply enjoyed the views. 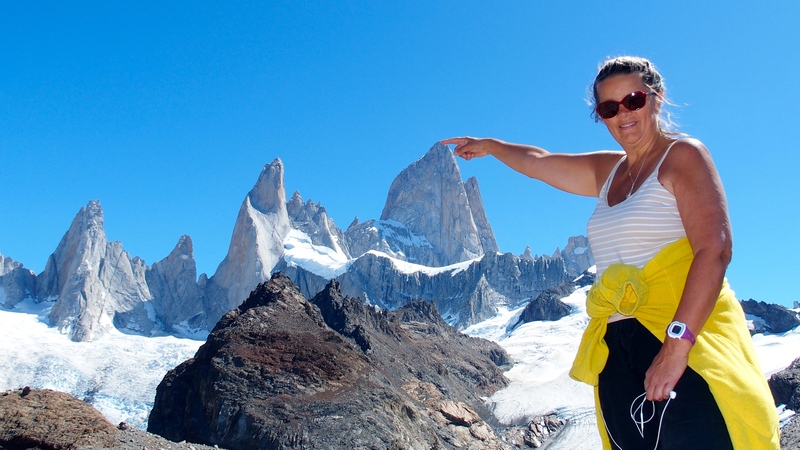 Nancy has conquered the top of Cerro Fitz Roy. Can’t get away from the view without a selfie of Nancy, Michael and Fitz. Counting steps, we had over 36,000 that day, about 18 miles. The next day was a bit more relaxing, taking a boat tour to see more glaciers. 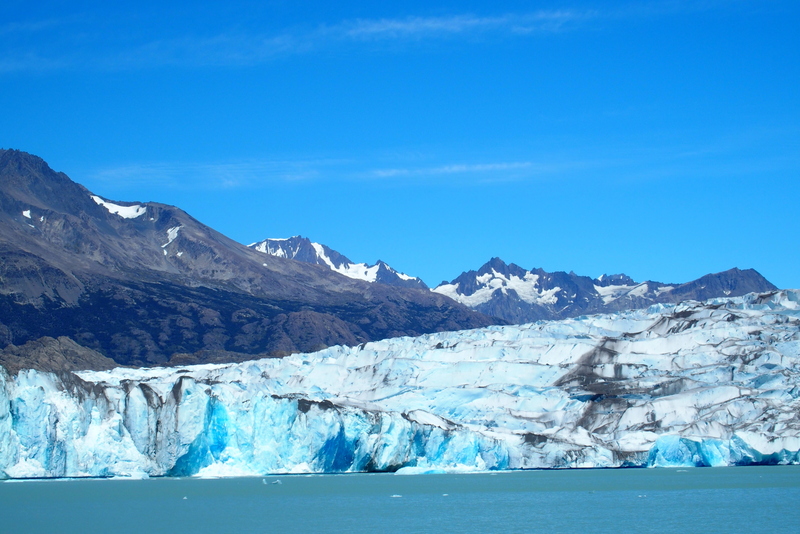 Glaciar Viedma in Lago Viedma, viewed from our large catamaran tour boat. 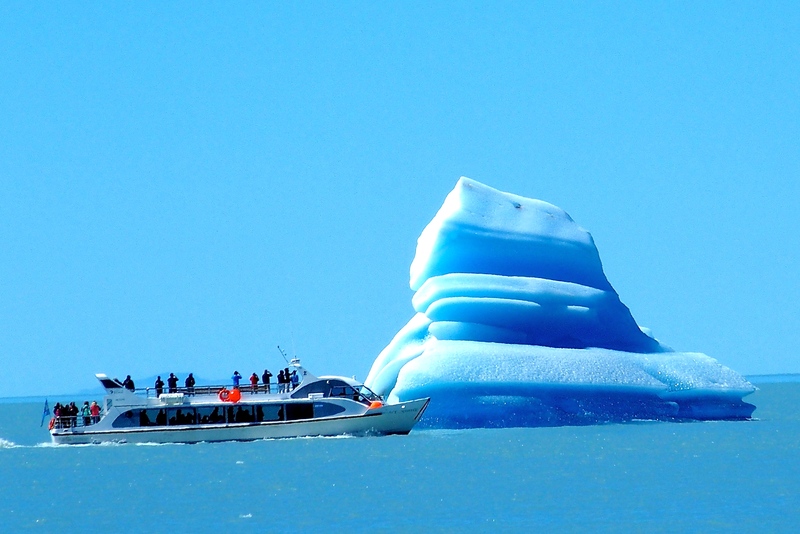 The icebergs from Glaciar Viedma can be huge! Too soon, we left the glaciers behind. We covered a lot of ground (and water) on this short trip. 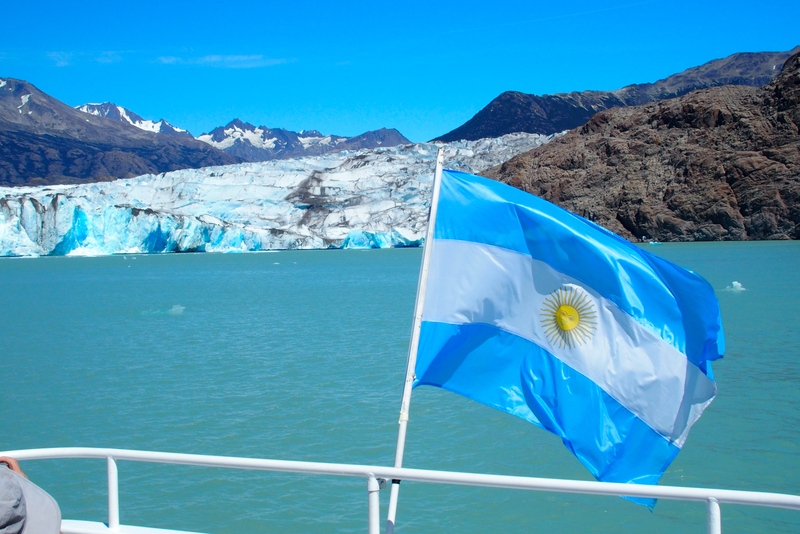 Moving on, we have a few more insights on Argentina before we travel to Chile. 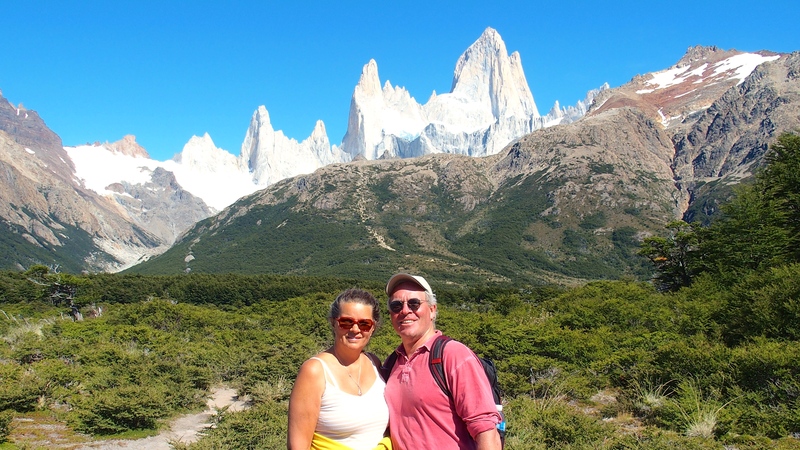 This entry was posted in Travel Journal and tagged Argentina, El Chalten, Fitz Roy, Glaciar Viedma, glaciers, hiking, Lago Viedma, mountains, Patagonia, Perito Moreno. Bookmark the permalink.